A party is a perfect place to practise fractions! Help this host or hostess prepare for the perfect party by dividing snacks and entrees into equal groups. Give your child a fun introduction to fractions with a visual fraction worksheet. He'll decide which picture matches the fraction given. 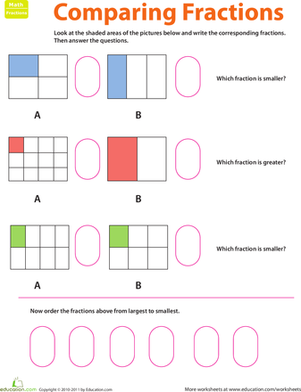 Here's a great introduction to fractions! Your child will get to visualize the simple fractions in halves, thirds and fourths with a faction picture. Help your child better understand fractions with a visual aide. He'll decide which picture shows the correct fraction. If your child has a handle on fractions, challenge her with an lesson on comparing fractions. Make fractions fun, with some stellar shapes! Your child will help this alien friend colour fractions of each shape, helping him visualize simple fractions. Make fractions fun, with some stellar shapes! Your child will help an alien friend colour fractions of each shape. He'll also visualize simple fractions.